The American Diabetes Association has updated their recommendations for movement for people with diabetes or those at risk for it. One key recommendation is to intersperse periods of sitting with at least three minutes of light physical activity such as walking, leg lifts, torso twists or overhead arm stretches, every 30 minutes. This is in addition to regular exercise. The previous recommendation called for physical activity every 90 minutes. Aerobic activity benefits patients with type 2 diabetes by improving blood sugar management, as well as encouraging weight loss and reducing cardiovascular risks. 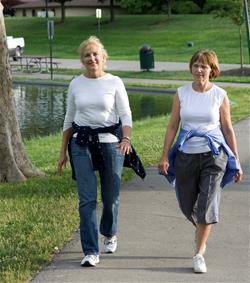 Movement that encourages flexibility and balance are helpful for people with type 2 diabetes, especially older adults. Regular exercise that incorporates aerobic and resistance training activities also offers health benefits for people with type 1 diabetes, including improvements in insulin sensitivity,cardiovascular fitness and muscle strength. More information can be found in the official statement published in the November 2016 issue of Diabetes Care: Physical Activity/Exercise and Diabetes: A Position Statement of the American Diabetes Association.